Balcony Collapse Kills 6 Irish Students In Berkeley, Calif. : The Two-Way "It is with great sadness that I confirm that a number of young Irish citizens have lost their lives," says Ireland's foreign minister. Balcony Collapse Kills 6 Irish Students In Berkeley, Calif.
A fourth-floor balcony rests on the balcony below after collapsing at the Library Gardens apartment complex in Berkeley, Calif., early Tuesday. A fourth-floor balcony gave way during a party in northern California late last night, killing at least six exchange students in a building close to the University of California, Berkeley. Seven other people were injured, some of them seriously. "All of those killed and most of those injured are Irish nationals, exchange students visiting the Bay Area to work for the summer," reports Dan Brekke of member station KQED. He adds, "Berkeley police say the collapse occurred at 12:41 a.m. [local time] during what's reported to have been a 21st birthday party for one of the students." 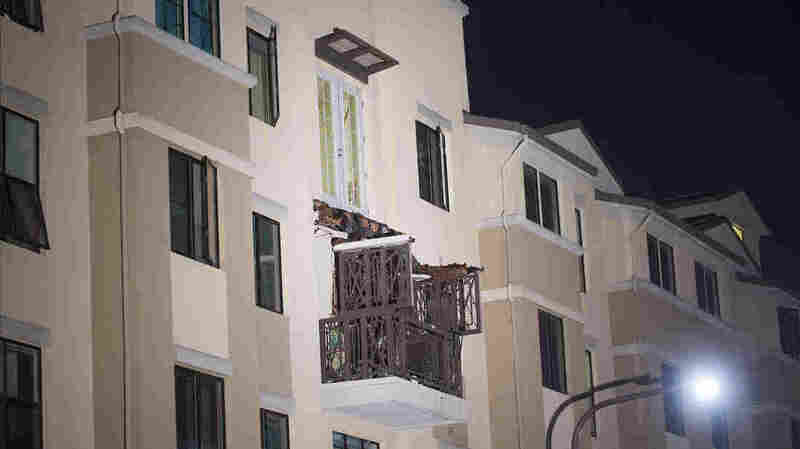 While some reports have suggested too many people at the apartment might have crowded onto the small balcony, KQED cites local media saying that photos from the scene suggest a lack of adequate waterproofing where wooden support beams meet the building's facade. "It is with great sadness that I confirm that a number of young Irish citizens have lost their lives while a number of others have been seriously injured following the collapse of a balcony in Berkeley, California earlier today." Flanagan added that the Irish consulate in San Francisco is in touch with local authorities, and that his agency has activated its emergency crisis center to handle requests for information from families and others who were affected.